Mica hanging lamp Pleasanton, CA Many of our lamps have clear Asian roots and fit beautifully with the artwork, furnishings and other accessories collected together here. 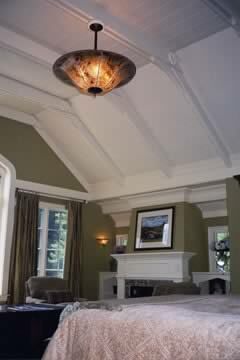 Mica ceiling and wall lighting in the master bedroom with custom hand-cut designs. Healdsburg, CA We made most of the custom lighting fixtures for this meticulous remodel. Sue incorporated plant and bird motifs from carpets, wall papers and tiling into many of the mica ceiling lights she custom designed for this home. 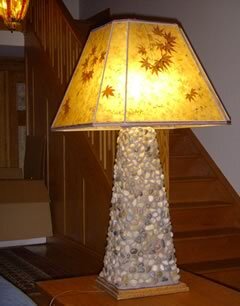 Custom Arts and Crafts, cut-corner mica shade with natural maple leaves.